This prayer was edited as more information became available. 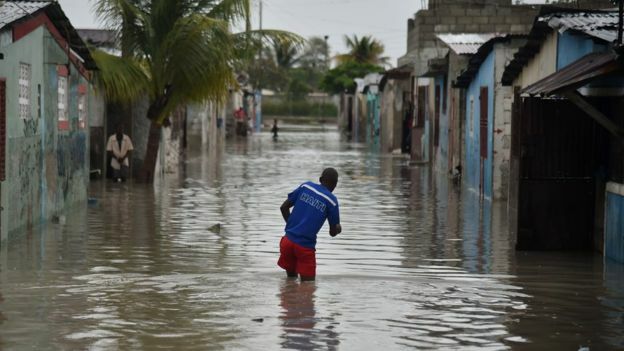 Lord, today we pray for Haiti in the aftermath of Hurricane Matthew. Sometimes it’s hard to know where to begin. Lord, first, we think of the hundreds upon hundreds of lives lost. It is overwhelming: people of all ages, killed in frightening ways by such a powerful storm. Each life lost is a tragedy and leaves families and friends reeling for decades. Please be with those who have lost loved ones. And, Lord, thousands of people have lost their homes and businesses; crops and livestock have been devastated. The rebuilding will take many years. Lord, please comfort the people of Haiti. May your children in Haiti be lights in the midst of this dark time, even though they are hurting and facing loss themselves. Lord, thank you that relief workers were finally able to reach the part of the country that had been cut off. Please continue to give them determination, resourcefulness and strength as they continue to uncover the loss, recover bodies and deal with the most urgent crises. We pray for not only hospitals that are without fresh water, but for the hundreds of family without fresh water. We pray against cholera and other diseases that may increase under these circumstances. Lord, may the best in people come out as people help, serve and show generosity toward one another. May those who are able to help do so quickly, safely and effectively. We pray against the looting and theft. Lord, convict the hearts of those who are tempted to steal from others as they deal with their pain. Help them to recognize that everyone is suffering during this time. Lord, we also pray for the non-governmental organizations that have representatives on the ground in Haiti right now, such as Reciprocal Ministries International. Thank you for their long-term presence in serving and loving and living among—being part of—the people of Haiti. Help them do what they do best in the midst of this devastation: assisting those around them, being present, sharing your love, meeting needs. Show us how we may help. May people around the world rise up to help the people of this small island nation. And may we not forget to pray as we go about our days. In Jesus’ name we pray, amen. For updates from Haiti and a chance to help in practical ways, visit https://www.facebook.com/reciprocalministries/?pnref=story.unseen-section. If desired, click on the “donate” link on their Facebook page, or visit here: http://www.rmibridge.org/. Lord, today we pray for Haiti in the aftermath of Hurricane Matthew. Sometimes it’s hard to know where to begin. Lord, thank you that loss of life appears to be minimal, despite major devastation. We are especially thankful for this, considering the nation was hit harder than anyone had expected. Lord, even though loss of life was “minimal,” each life lost is a tragedy and leaves families and friends reeling for decades. Please be with those who have lost loved ones. And, Lord, thousands of people have lost their homes and businesses; crops and livestock have been devastated. The rebuilding will take many years. Lord, please comfort the people of Haiti. May your children in Haiti be lights in the midst of this dark time, even though they are hurting and facing loss themselves. Lord, we pray for relief workers and others who are trying to creatively gain access to the part of the country that has been cut off by damage. We pray for people to have peace and ingenuity as they deal with not only lack of access, but lack of phone communication. We pray for those hospitals that are without fresh water. Lord, may the best in people come out as people help, serve and show generosity toward one another. May those who are able to help do so quickly, safely and effectively. Lord, we also pray for the non-governmental organizations that have representatives on the ground in Haiti right now, such as Reciprocal Ministries International. Thank you for their long-term presence in serving and loving and living among—being part of—the people of Haiti. Help them do what they do best in the midst of this devastation: assisting those around them, being present, sharing your love, meeting needs. Show us how we may help. May we not forget to pray as we go about our days. In Jesus’ name we pray, amen. An opportunity just arose to provide food for affected families at a discounted rate: http://www.rmibridge.org/store/p162/Food_For_Health_-_Ministry_Opportunity.html?utm_source=C3+Partner+Posts+updated+Mar+03+2017&utm_campaign=2af779fd71-EMAIL_CAMPAIGN_2017_03_14&utm_medium=email&utm_term=0_10f9660dad-2af779fd71-113292729.